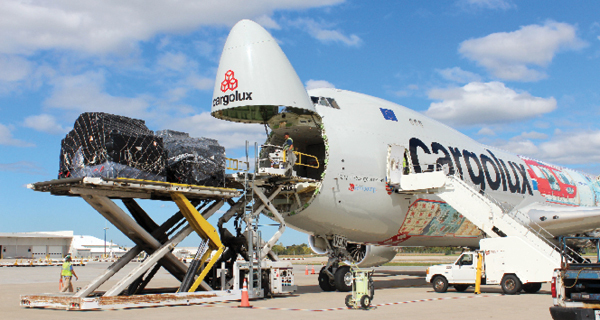 Rickenbacker International Airport, one of the world's only cargo-focused airports, offers an uncongested option to move air cargo to, from, and within the United States. A crew at Rickenbacker International Airport in Columbus, Ohio, recently unloaded a 777 in just 90 minutes, says Christopher Dale, president and chief executive officer, USA, with Hellmann Worldwide Logistics. Once the plane was unloaded, the goods were trucked a mere 50 yards to a warehouse. "A plane lands and it's immediately unloaded, versus waiting in queue," he says. That's not always the case at other airports, he adds. That speed translates to more efficient and cost-effective supply chains. Rickenbacker International Airport is a key element of Rickenbacker Inland Port, a multimodal logistics hub that offers efficient distribution through much of the U.S. and Canada. The inland port is home to providers of logistics, warehouse and aviation services. It offers direct connections to major ocean ports by rail on both coasts, including Norfolk, Va., New York, Los Angeles, and Savannah, Ga.